We are equipped with 2 Heavy Duty Belt Winders, 2 Heavy Duty Vulcanisers, 2 Light Weight vulcanisers, 1 Repair Vulcaniser and 3 Service vehicles. 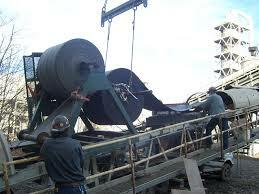 Contact us today or visit our Conveyor Belt Company site today. Dalby General Steel have all your steel, building and rural supplies needs. Start browsing above or search for you want directly.